Four Quadrant Operation of any drives or DC Motor means that the machine operates in four quadrants. They are Forward Braking, Forward motoring, Reverse motoring and Reverse braking. A motor operates in two modes – Motoring and Braking. A motor drive capable of operating in both directions of rotation and of producing both motoring and regeneration is called a Four Quadrant variable speed drive. In motoring mode, the machine works as a motor and converts the electrical energy into mechanical energy, supporting its motion. In braking mode, the machine works as a generator, and converts mechanical energy into electrical energy and as a result, it opposes the motion. The Motor can work in both, forward and reverse directions, i.e., in motoring and braking operations. The product of angular speed and torque is equal to the power developed by a motor. For multi-quadrant operation of drives the following conventions about the signs of torque and speed are used. When the Motor is rotated in the forward direction the speed of the motor is considered positive. The drives which operate only in one direction, forward speed will be their normal speed. In loads involving up and down motions, the speed of the motor which causes upward motion is considered to be in forward motion. For reversible drives, forward speed is chosen arbitrarily. The rotation in the opposite direction gives reverse speed which is denoted by a negative sign. The rate of change of speed positively in the forward direction or the torque which provides acceleration is known as Positive motor torque. In the case of retardation, the motor torque is considered negative. Load torque is opposite to the positive motor torque in the direction. The figure below shows the four quadrant operation of drives. In the I quadrant power developed is positive and the machine is working as a motor supplying mechanical energy. The I (first) quadrant operation is called Forward Motoring. II (second) quadrant operation is known as Braking. In this quadrant the direction of rotation is positive, and the torque is negative, and thus, the machine operates as a generator developing a negative torque, which opposes the motion. The kinetic energy of the rotating parts is available as electrical energy which may be supplied back to the mains. In dynamic braking dissipated the energy is dissipated in the resistance. The III (third) quadrant operation is known as the reverse motoring. The motor works, in the reverse direction. Both the speed and the torque have negative values while the power is positive. In the IV (fourth) quadrant, the torque is positive, and the speed is negative. This quadrant corresponds to braking in the reverse motoring mode. Compressor, pump and fan type load requires operation in the I quadrant only. As their operation is unidirectional, they are called one quadrant drive systems. Transportation drives require operation in both directions. If regeneration is necessary, application in all four quadrants may be required. If not, then the operation is restricted to quadrants I and III, and thus dynamic braking or mechanical braking may be required. In hoist drives, a four-quadrant operation is needed. 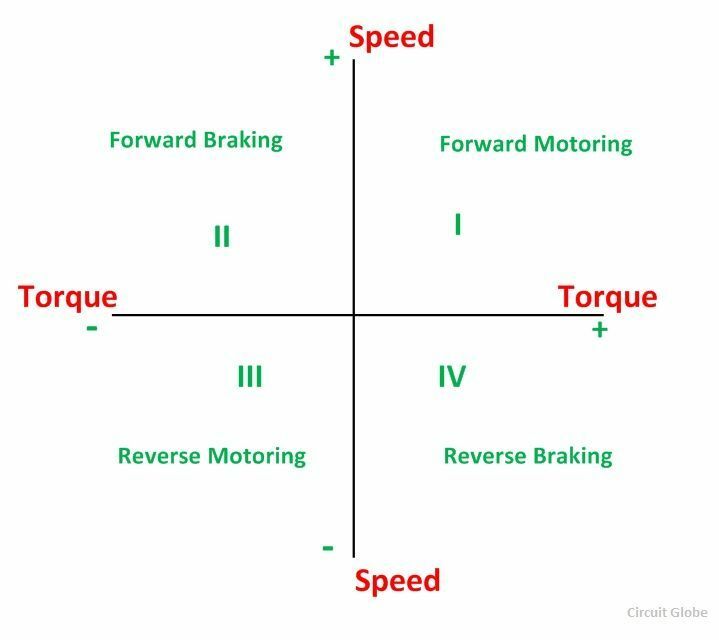 The four quadrant operation and its relationship to speed, torque and power output are summarized below in the table.